HealthProm launched its new five year organisational strategy in 2017. This new strategy (2017-2022) reaffirms our commitment to the mission, vision and values which already underpin HealthProm’s work. We see a continued catalytic role for HealthProm in supporting and empowering local partners to tackle the continuing challenges of childhood institutionalisation, social exclusion of children with disabilities and persistently high levels of maternal and child mortality in countries like Afghanistan. 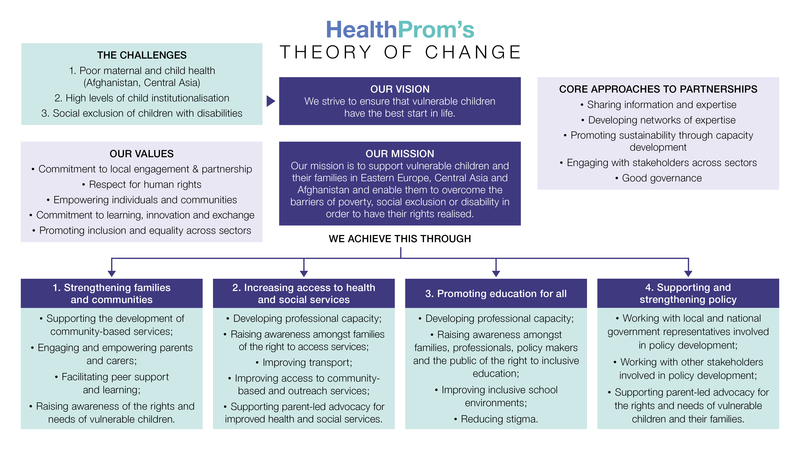 An Executive Summary of the new strategy and HealthProm's Theory of Change can be downloaded below.